There’s no shortage of weather folklore to be found, in which the rhythm of the seasons can be a harbinger for predicting coming temperatures. This one seemed particularly fitting to our current weather in Minnesota. When leaves fall late, Winter will be severe. Our whole theater of seasons in Minnesota was far, far behind the norm this year, with snow falling on May 1st, the growing season extended to near the end of October, and Autumn leaves peaking weeks behind schedule. Is it all an indication that our Winter will continue to be caught in a deep freeze? Stick around. Decembers as of late have been all across the board for weather; we’ve had monster blizzards (December ’10) that dumped nearly 2-1/2 feet of snow on us, and Christmas weeks that have had nothing but hard rain (December ’12). This December, it’s been the season of sub-zero temperatures. It’s a languid post-Christmas week (languid for me as I took 9 days off after Christmas), and we’re already experiencing a second round of deep cold and unpleasant wind chills, of complaining and groaning over why one lives in such a place, running through Instagram photos of island vacations past, to dream of warm sand and sunshine and forget that exposed skin could acquire frostbite in just 10 minutes exposure outside. We bake to ward off the chill, simmer kettles of soup or slowly braise a comforting pot, cuddle under blankets, binge-watch Netflix and Hulu or movie catalogs, or just plain deal with it when the temperatures plummet and the wind bites with gnashing teeth at our skin. But one thing remains; we’re all in this together. Cold weather isn’t much of an issue with me. I’ll add another layer, pull out the thick, warm wool mittens, tug on some leg warmers and keep my head down from the wind. Inside, I slip on wooly hand warmers, sheepskin slippers and invite the cats for a snuggle. Cranking up the oven helps too, as adding warm, cozy foods to the menu is the best way to keep warm from the inside. 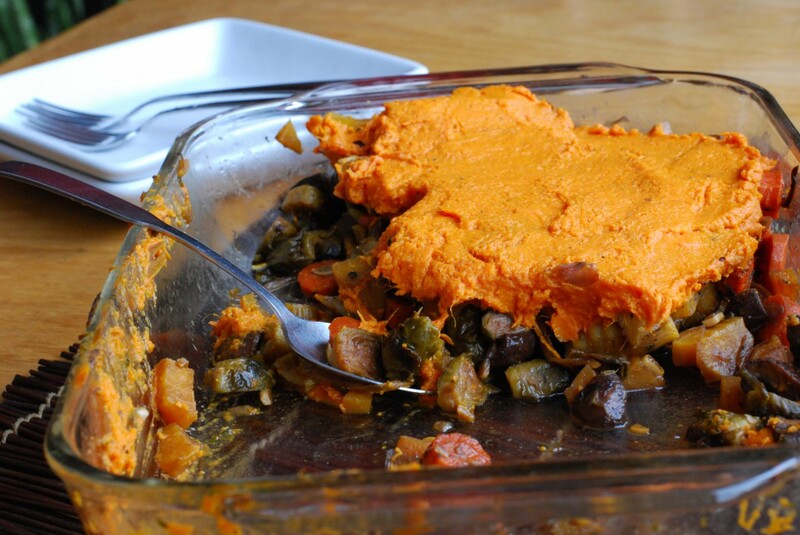 This Vegetable Shepherd’s Pie was created as a vegetarian entree I was designated to bring for a Christmas gathering with my in-laws. I wanted something that would be universally accepted across the board by all the various dietary needs of our extended family; the Primal eaters, the wheat-free, the dairy-free and the meatless. It covers all those bases with it’s lush pile of heavenly roasted vegetables bathed in a balsamic glaze and a simple shower of salt and pepper. I chose not to use a binder to hold it all together, and instead of rich, buttery potatoes coating the top, I used roasted sweet potatoes, spun to a silken mass with a hand-mixer, touched only with good seasonings. The result was remarkable in flavor, eye-catching in presentation. I was thankful that it was so well-received, and grateful to have still a large portion to bring home and consume, post Christmas, as the deep cold set in. Don’t be put off by the long recipe; you roast most of the vegetables, which can be accomplished while the sweet potatoes and beets do their thing in a hot oven. You’ll spend some time prepping those veggies, but putting it all together happens quickly. You can make the recipe in two 8×8 pans, saving one in the freezer for another time. Another elegant presentation would be to portion out ramekins for individual servings, an ultimate dinner party delight. The recipe makes plenty of filling to do with as your creativity leads you. Best of all, when the temperatures drop and your belly growls it’s hunger at you, this feeds you with warmth, good health and well-being. For the upcoming winter, you’ll love having this in your repertoire. Heat oven to 400 degrees. You will be roasting all of the vegetables except for the celery, onion, mushroom and garlic. They will all take different amounts of time to finish, so start with the ones that will take the longest: poke the sweet potatoes a few times with a sharp knife and place on a foil lined baking sheet. Wrap beets well in foil. Place both in hot oven and roast until tender. A fork should slip easily in to the beets when they are done. Set aside to cool. In a bowl, toss parsnips with a bit of olive oil and salt and scrape onto one side of a baking sheet. Repeat with carrots, and place on the other side of the baking sheet. Roast in hot oven until just tender. Place back in bowl and set aside. Repeat with Brussels sprouts, roasting until just tender. Scrape from pan in to bowl with parsnips and carrots. Meanwhile, in a large, deep skillet, warm 2 tablespoons of olive oil and 2 tablespoons butter. When bubbling, add mushrooms, and sauté over medium-high heat, stirring regularly, until they release their liquid. Add onion and celery and continue to cook, stirring often, until they soften, about 5 minutes. Reduce heat slightly, and cook for about 10 minutes, allowing the mushrooms to brown in spots and become very fragrant. Stir in garlic and sauté for about a minute, then add about 1/3 cup of balsamic vinegar. Scrape up any browned bits in the skillet, and simmer until the vinegar is absorbed. Add in the parsnips, carrots, and brussels sprouts and 1/4 cup balsamic vinegar. Stir to combine and allow to simmer over low heat for a few minutes. Turn off the heat. Peel the beets, chop in to bite sized pieces and stir in to vegetable mix with the fresh herbs. Scrape entire pan in to a 9×13 baking dish. 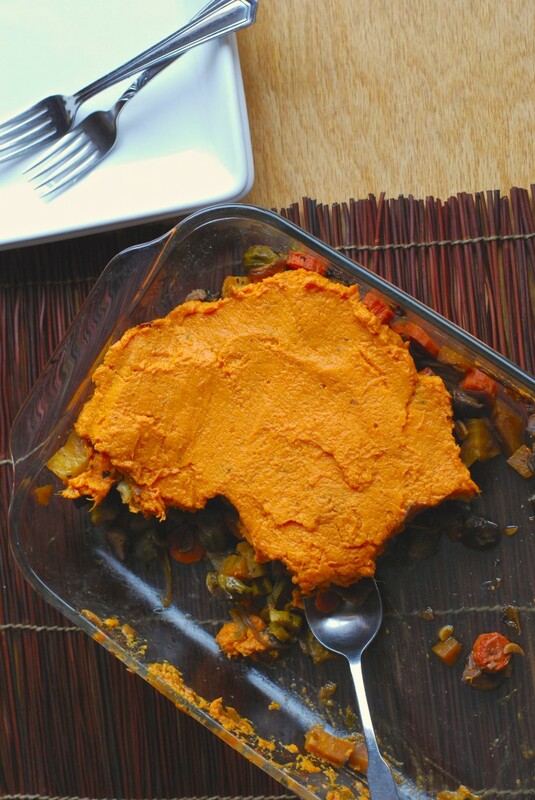 Peel sweet potatoes and place in a bowl. Mash with a fork, or potato masher until smooth and creamy, season with salt and pepper. Spread evenly over vegetables. Place back in the oven for 15-20 minutes to heat through. Long slow cooking processes make some of the most intensely satisfying meals, especially on a chilly day. Something simmering on the stovetop, or in a crockpot or oven has a soothing effect against a cold wind knocking the windows, lashing bare branches about. 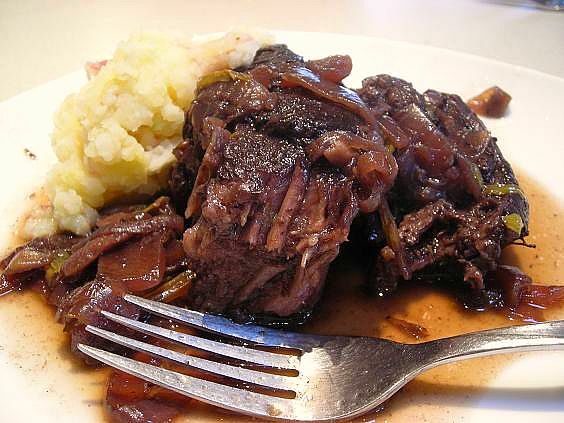 One of my most favorite meals as a kid was our regular pot roast night. We had one at least once a week, as a thick cut of chuck roast, along with a whole slew of potatoes and carrots, made an easy meal that every one of my siblings and I devoured. It’s pretty hard to mess up too; a slow cooking time is all you really need, along with something to make the meat taste wonderful. The quickest way I found to give the meat ultimate taste is to braise it slowly in a bottle of deep red wine. The meat becomes meltingly tender, so tender that the slightest pressure from a fork breaks it easily into chunks of rich, beefy flavor. Get yourself an inexpensive bottle of good, dark red wine for this dish; I’d use any type of bargain Cabernet Sauvignon, a decent Pinot Noir, good hearty Malbec or Carmenere or a lush Portugese red table wine. Any dark red Spanish wines will complement this as well. You want good earthy flavor for beef; the fruit-forward red wines don’t make for the best pairing here. I like to saute several onions until they are deeply caramelized and dark brown. This will develop a great deal of flavor for the base of your dish. Use an oven-safe pan to do this, then when you are all done with the browning, you can cover it and put it right in the oven. After you sear the onions (and some garlic) scrape them in to a bowl, then sear the meat to a rich brown on both sides. Remove that to a plate, add the entire bottle of red wine and scrape up the fond on the bottom of the pan. Put the meat and the caramelized onions back in the pan, sprinkle a bit of salt and pepper on it, then cover it and place it in a low oven, 300°-325° to just let the oven slowly work it’s magic on the mixture. Check it after two hours or so; if a fork slips right through it with little resistance, and the meat falls apart easily, it’s done. If not, replace the cover and continue cooking to those results. It’s been a long time since I’ve had this dish, several years, in fact. I probably wouldn’t make it now, unless it was specially requested by Griffin. This was a favorite for him too. That boy and his beef are a complimentary pair. What’s on YOUR plate this month?? If you recall, Whole Foods invited me to participate in a 28-day challenge based on the Engine 2 eating plan (I hate the word ‘diet’ and won’t use it) that calls for a 100% plant based way of food consumption. It goes so far as to exclude fats and salt as well. My take on it was to kick out the meat. We eat more than I want mostly because my teenager really loves meat, but Mike and I were getting tired of it. And it’s the costliest item in our food budget. As well as going meat-free, I’ve cut out my beloved butter, the only dairy I consume and I’ve cut down on oil usage and tried to avoid salt. So… two weeks in to this eating plan, and what’s been happening? #1- The teenager is a bit miffed. ‘What do we eat! ?’ he says with emphatic resignation. But the meat free meals that leap from the stove top have him devouring his portion with gusto. I’ve given in to his need for meat on occasion, utilizing small amounts of chicken for him, and having a meal with shrimp. But this boy is not suffering. No no…..
#2- My pants fit better. And I can get myself in to two pairs of jeans that I haven’t been able to wear since last summer. Some of the belly fat is disappearing. I think my face looks thinner. I have a bit of a way to go with reaching what I think is an ideal weight for me, but this eating plan wasn’t about losing weight at all. I needed maybe a 10 pound drop at most and when I started the plan I had already lost about 5 of those pounds. For me, this is about eating more healthy foods and feeling better. #3- This is a big one. Several months ago I started experiencing symptoms of menopause, mostly in the way of hot flashes. They had become really intense, and a constant in my day. They’d cover my neck and shoulders, resulting often in getting so overheated that the underside of my hair would become very damp. And the worse ones came at night, radiating through my pelvis and hips and down my legs, causing me to kick off the blankets to cool down. I’d fall asleep, then waken later absolutely freezing. This night cycle went on and on, and it wasn’t helping my sleep patterns at all. But since giving up meat consumption, the hot flashes have fallen off dramatically, the lower body ones disappeared completely and the consistency has been reduced to only a few light ones each day, mostly very manageable. No more damp hair!! And this happened within days of giving up meat. It’s been completely unexpected but such an amazing finding. If I’d known giving up meat would help this, I would have done it ages ago. Another physical aspect that has fully disappeared when meat left my meals is any kind of stomach upset. I’ve been blissfully comfortable for the past two weeks with no indigestion, no upset or gas and no bloating. #4- I miss my popcorn fix, but that’s about the only food I really want to be eating that I’m not. I simply can’t eat popcorn without melted butter and salt, and at least once a week I would pop a big bowl of it and crunch crunch crunch my way through, sighing in contentment, slurping buttery salty fingers and smiling through eyes half closed in a popcorn induced ecstasy. I think I love the sensation of it, the textural pleasure of eating something so noisy, and so flavorful. I don’t really miss meat, nor crave it. See #3. But I really miss my popcorn. What this plan is doing for me that I do love is really giving me a lot more reasons to look at the foods I eat and make the best possible choices. I was out for an evening with some friends and had to take a good hard look at the menu options for something that fit this challenge; thankfully I had three choices to pick from, all of them acceptable. Eating out may be more challenging, and thankfully we don’t do it that often. But we’ve also been eating pretty mindfully prior to starting this plan. This gives us a reason to take it one, or ten steps further. This pasta dish is halfway acceptable for the eating plan, in that it’s loaded with braised kale. The fettuccine isn’t exactly E2 friendly, but it was what I wanted to eat after an intense afternoon of gardening. Sometimes you’ve just got to allow for a dish that nourishes the soul as well as it fills the belly. I really struggle with any aspect of eating that deprives us of what we really want. If I really want popcorn, I’m going to make it. If I want a juicy bratwurst, I will grill one so that the skin splits and it sizzles in delight, pressed between the edges of a perfect bakery roll and slathered with the best mustard in my fridge. But at the same time, what I put in this body of mine, the only one I’ve got, really does make a difference in how I feel, the energy I have and the way I get through my day. I’ve felt it, noticing when I don’t eat healthy foods and had to force myself through the side effects of poor eating; the sluggishness, the lack of energy, the belly aches or heartburn. I’m not harming myself by consuming a grilled piece of chicken, or some perfectly cooked shrimp. And I’ve found that by really paying attention to making 90% of the foods I eat be healthy, plant based foods, it really has made a huge difference in how I feel. Should I go to 100%? Should I give up the oils, the salt? Should I? For me, this alternative plan makes sense. I like the results, the way it makes me feel and the relative ease on my pocketbook. And if in just two weeks it’s got me thinking of even more ways to have healthier options in our meals then I feel it’s achieved something great. Like I said about this dish, it fit what I really wanted to be eating, when the hunger became so great from all the activity that I’d done I found myself with shaky hands and that trembly feeling of a deeply low blood sugar. 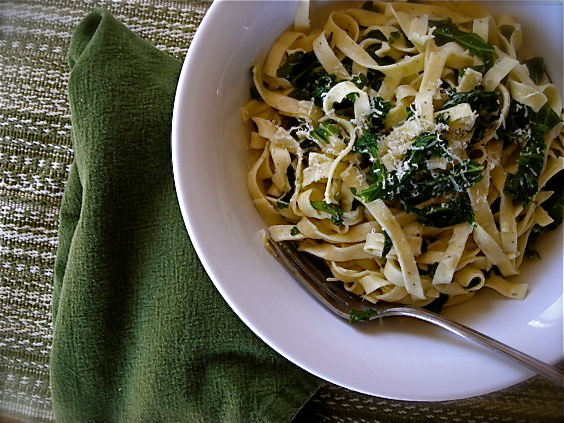 I needed about 20 minutes to gently cook the kale until it was silky soft and lush, and only a few minutes to cook the fresh dried fettuccine I had on hand. A toss together in the deep skillet with a few dashes of lemon juice and some rosemary Manchego cheese I had on hand (totally not E2 friendly, but ah well…..) and I sat down with a deep bowl, a thick heavy fork and a content sigh. It had been a long day, but a full one, one with accomplishments and a lot of good spring sunshine. Eating a terrific and healthy meal was like placing a fancy top hat on the end of this day, and swinging off with a jaunty step. Rinse kale. Drain; transfer to bowl with some water still clinging. Heat 2 tablespoons olive oil in heavy large pot over medium heat. Add chopped onion and cook until soft and translucent, stirring occasionally, about 6 minutes. Add sliced garlic and sprinkle with salt; cook until onion is golden brown, stirring occasionally, about 5 minutes. Add kale and remaining 1 tablespoon olive oil and toss until wilted, about 3 minutes. Cover pot and reduce heat to medium-low. Continue cooking until kale is very tender, stirring occasionally and adding water by teaspoonfuls if dry, about 20 minutes. Meanwhile, cook spaghetti in medium pot of boiling salted water until tender but still firm to bite, stirring occasionally. Drain, reserving 1/4 cup cooking liquid. Add cooked spaghetti to kale mixture in pot. Add lemon juice and 2 tablespoons reserved cooking liquid; toss to combine, adding more liquid by tablespoonfuls if dry. Sprinkle spaghetti with grated Parmesan cheese and serve. 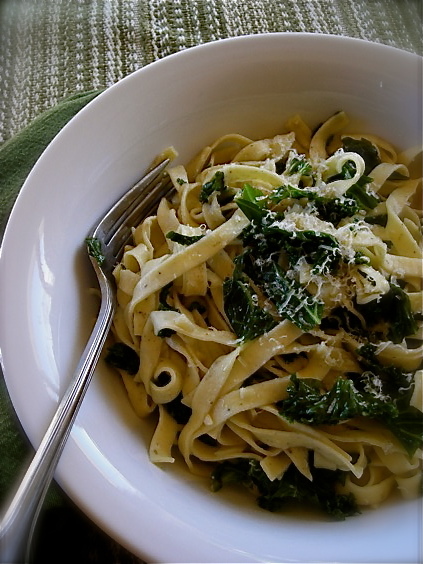 KATE’S NOTES: I made this with regular curly leaf kale, and used a 16-oz bag of gourmet basil fettuccine in place of the spaghetti. I did not use onion, and only used 3 cloves of garlic; it was plenty! Do make sure you give the kale a nice slow simmer. The result is so tender and delicious that it’s positively addicting, and well it should be. This recipe is what turned Molly’s mind away from hating kale and I’m pretty sure if you let it, it will do the same for you.